Fisherman's Market at The Central is a gorgeous place. 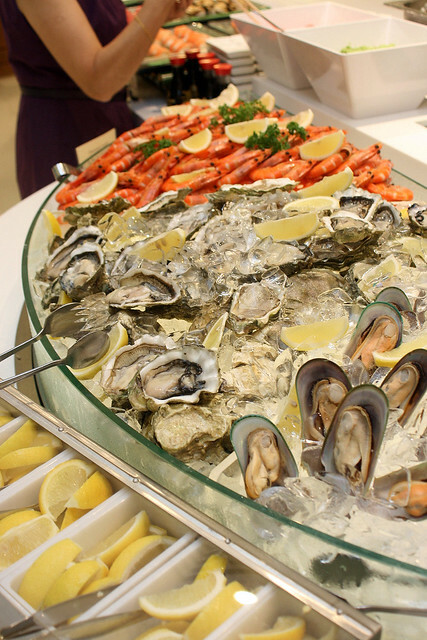 As you ascend the escalator into the primarily white hall filled with beautifully presented seafood, you'll feel like you've just floated up to heaven. There are so many Japanese buffets in Singapore (see my list of almost 40 Japanese buffets here), but this one is positioning itself as a premium Japanese-Western-Asian seafood buffet. The name may be similar to Manhattan Fish Market, which is also at The Central, but there is no relation. 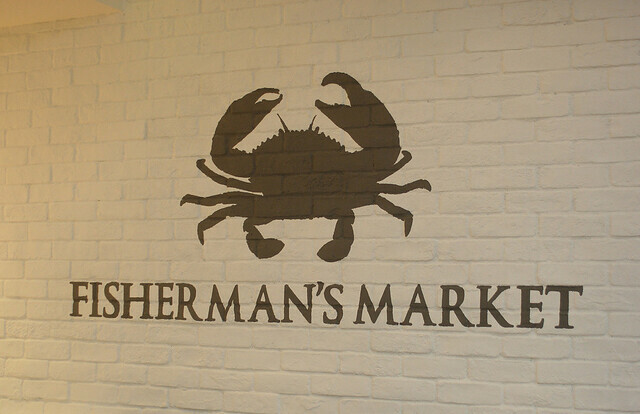 Fisherman's Market is a Japanese brand set up by Create Restaurants, a conglomerate with 110 F&B concepts in Japan. This is their first endeavour in Singapore. I will have to say, I absolutely love the soothing decor of white, wood and glass. 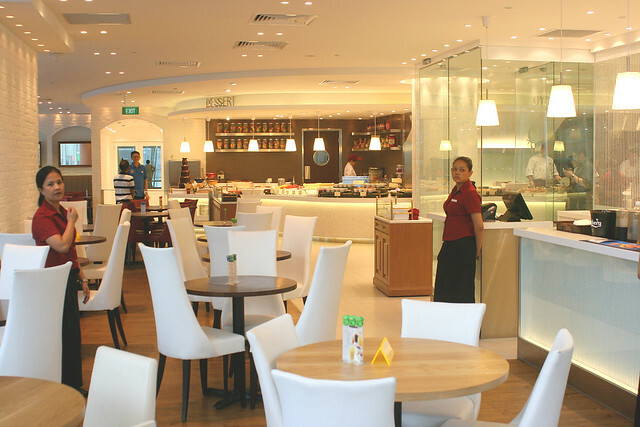 There is ample space and a high ceiling for one half of the restaurant. Double-storey floor-to-ceiling windows give you a grand view of the Singapore River and Clarke Quay. Of course, I was too distracted by the food to take a photo of that view until it was too dark. The food does look amazing. Seafood on ice - oysters, prawns, mussels, etc...all of which I did not try, but I heard raves about the oysters and scallops from others. Everything is neatly and compactly arranged, so it does not look like an overwhelming lot, but there are up to 90 dishes available! I wasn't even able to try a quarter of the stuff there. As with a buffet this size, there is definitely something for everyone, but it will also be tough to do everything perfectly. 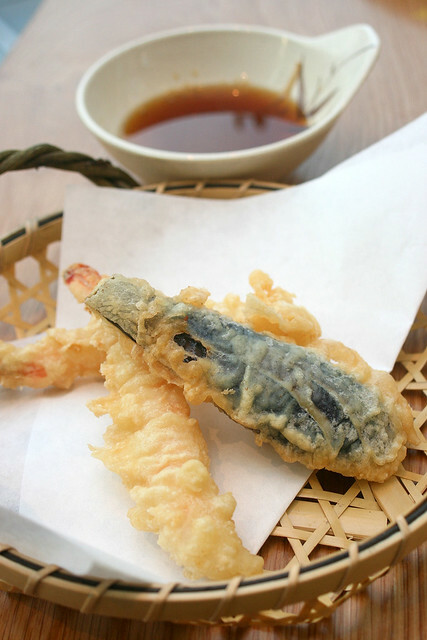 I appreciate that the tempura is fried only upon order. Every table is given a few clip tags, which you present to the stations (there's teppanyaki and tempura) and they will bring your order to your table once it's done. No waiting necessary. How nice. 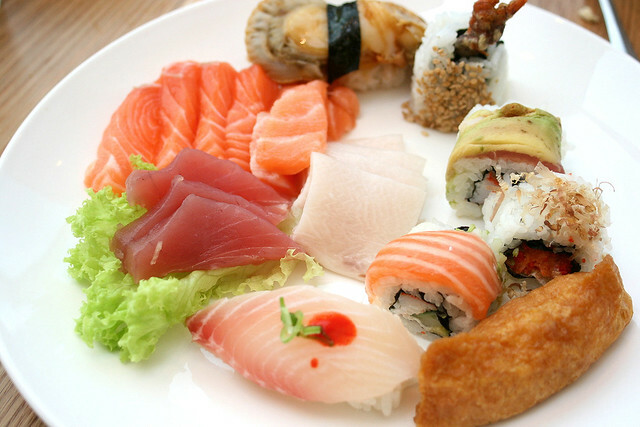 There are various kinds of sushi available, all done by native itamae. The Japanese sushi chefs do manage a bit of English, and can tell you what ingredients are used. The hot mains are fairly decent. The kids loved the pasta vongole bianca (what is it with kids and pasta?) and seafood fried rice. However, the chili crab and black pepper crab did not have much meat in them, so it may be more worthwhile trying other items than cracking those shells. The dessert station may look small, but it holds some of the best goodies here. We all loved the DIY soft-serve ice cream machine, and I am glad to say the ice cream tastes way better than McDonald's (which now has this almost artificial milk powder flavour). Don't miss the creme brulee - it's divine! Super rich and eggy too. You can ladle some of the "Macedonia" fruit cocktail mix onto your ice cream too. The tapioca pearls in the coconut milk are a little undercooked though. 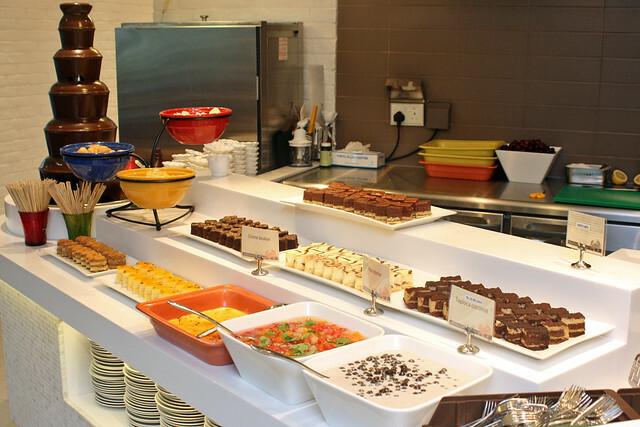 The buffet is dinner only, but there is also a la carte downstairs for lunch. Thanks to Word of Mouth and Create Restaurants for the invitation. This place looks amazing. 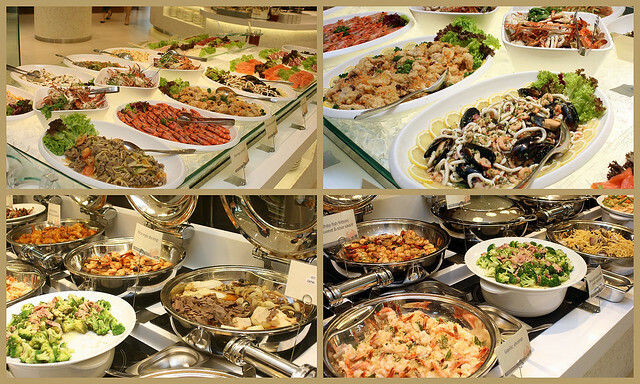 which would you choose: Todai Seafood buffet or this one?? I wish I had more time to try everything! Anonymous: I'd say Todai has a much bigger spread, for just a little bit more. This one seems very pretty and dainty. Kenny: yes, and it stays so true to the Japanese aesthetic! The food at Fisherman's Market is really pretty bad. had it on sat . the food stations were empty n took long time to fill. n the raw food such as the salmon n oysters r bad. nt fresh n cold to take. I agree with the previous anonymous comment. It's really quite bad. Had it last fri. Even tho e oyster are freshly opened, they dont taste fresh. Curry fish head, clam chowder and even the chilli crab sauce are watery hence not much taste. Pretty much like Sakura buffet's standard but at 2 times the price. Oops, about to go and try this Wednesday with my family. Thought they should be good because it is operated by Japanese company. What a pity, have to find another place where the oysters and sashimi are fresh since they are raw. Any suggestions where I can go and find really fresh oysters and sashimi? 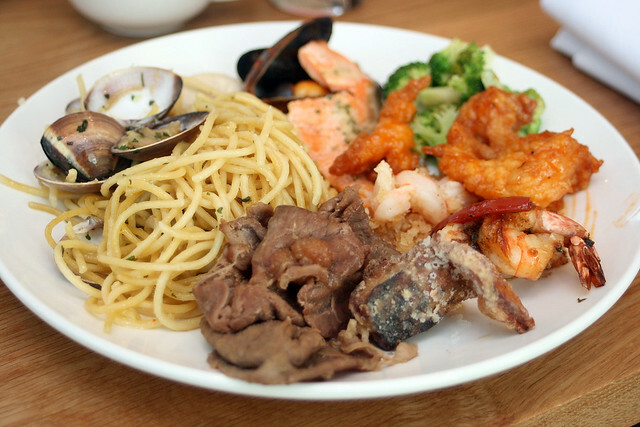 I like the platter meal consisting of a little bit of everything. I will check the place out.